Frequency hopping using DSP ~ Engineering projects ideas for final year students & paper presentations collection blog. 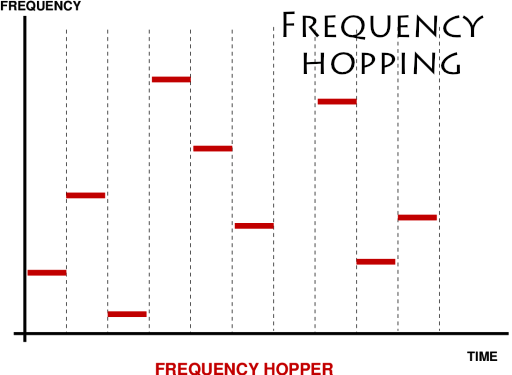 To maintain secrecy of the message signal the process of Frequency Hopping is employed in V/UHF transceivers operating in hopping mode in the UHF range when ECCM module is inserted which issues hop pulses, which are presently 8 to 40 hops/sec along with the frequency information to the Synthesizer module using DSP Technology. Central timing unit synchronizes both transmitter and receiver simultaneously. The ECCM commands are sent to the TMS320C5X DSP processor and latch circuits and then to the synthesizer module. When the hop pulse occurs from the ECCM module, the frequency information along with the hop pulse is sent to the Synthesizer module as it is. In between the original hop pulses; the program for DSP processor will generate new frequencies, which will act as hop pulses for the V/UHF transceiver.